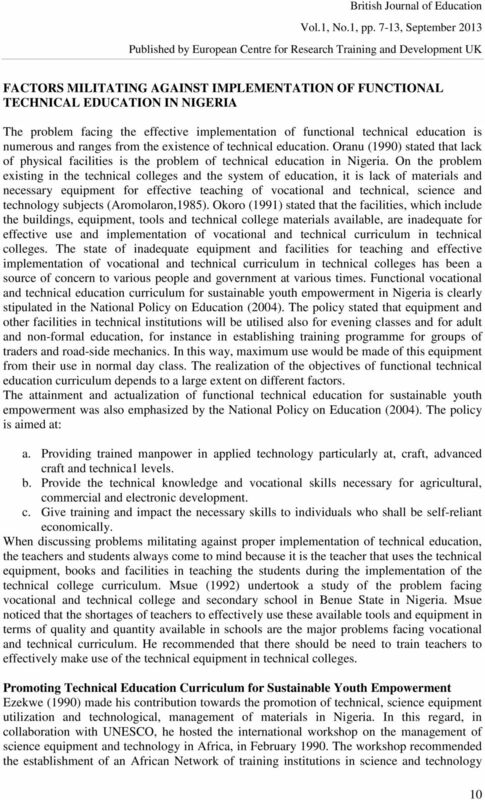 Download "FUNCTIONAL VOCATIONAL AND TECHNICAL EDUCATION CURRICULUM FOR SUSTAINABLE YOUTH EMPOWERMENT IN NIGERIA. UMUNADI, Ejiwoke Kennedy Ph." 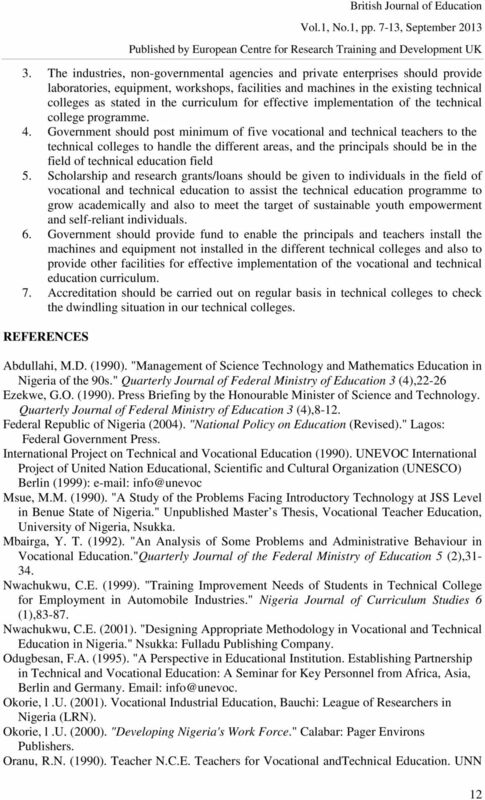 E.E.P-86 FEDERAL DEMOCRATIC REPUBLIC GOVERNMENT OF ETHIOPIA EDUCATION AND TRAINING POLICY Addis Ababa April, 1994 First Edition 1994 ST. GEORGE PRINTING PRESS TABLE OF CONTENTS Page 1. INTRODUCTION 1 2. 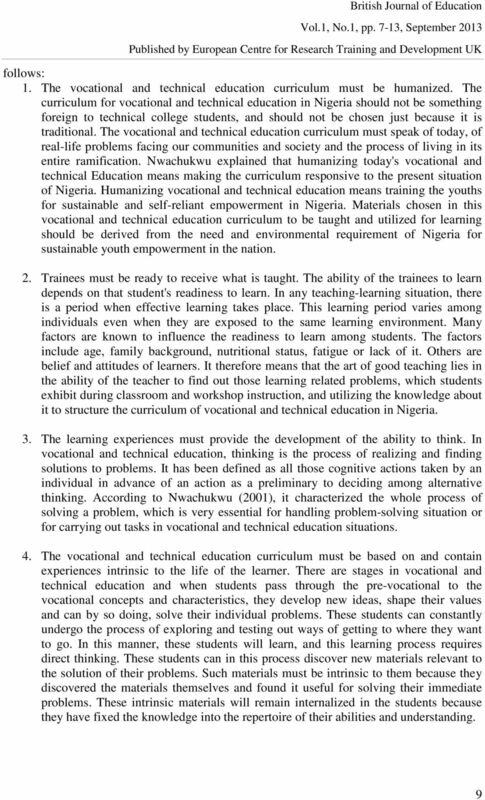 CHALLENGES THAT BESET PRIMARY EDUCATION STUDIES IN NIGERIA: THE WAY FORWARD B. C. Ezema Abstract This study explored the challenges that stall the positive advancement of primary education in Nigeria. 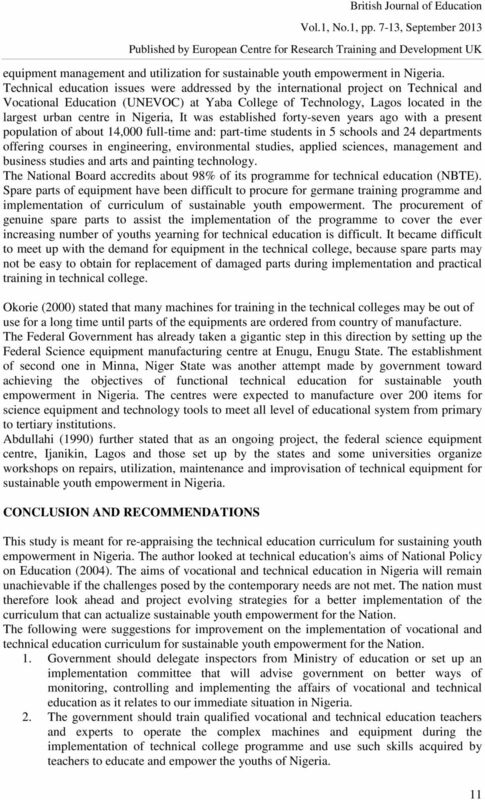 PROMOTING SKILLS for SUSTAINABLE DEVELOPMENT There can be no sustainable development without education Environmental, economic and social indicators tell us that our current model of progress is unsustainable. 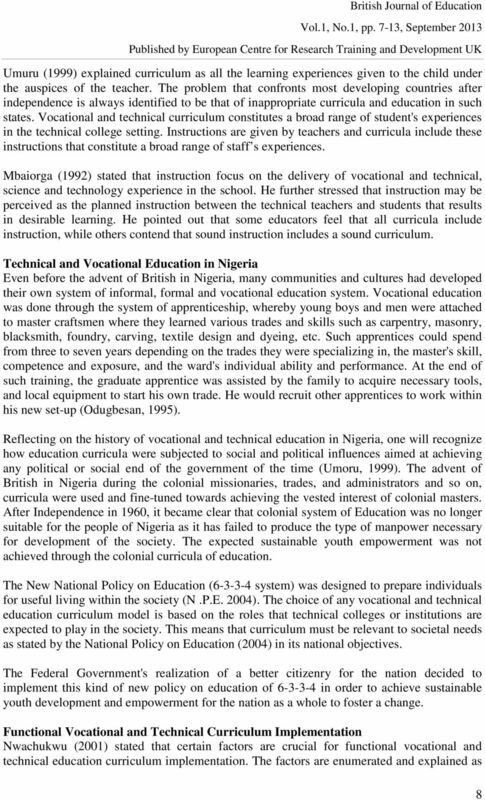 ED 019 490 OUTLINES OF VOCATIONAL TRAINING IN TANZANIA. AUSTRALIAN DEPT. OF LABOUR AND NAT. SERVICE, PERTH PUB DATE EDRS PRICE ME -$0.25 HC-$0.52 11P. 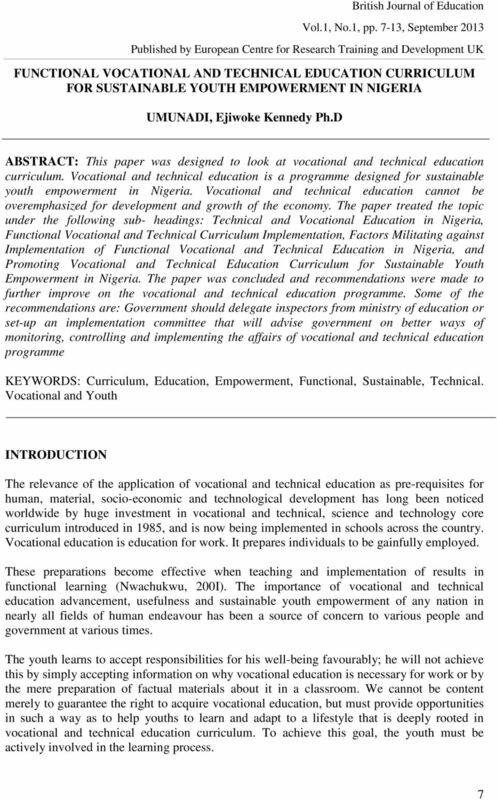 DEVELOPMENT OF TEACHER EDUCATION IN NIGERIA DR. (MRS.) A. A. JEKAYINFA DEPT. 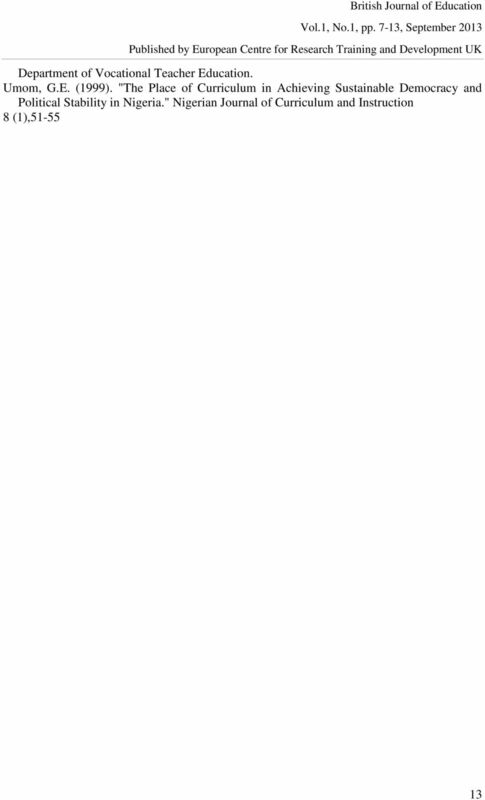 OF CURR. STUDIES AND EDU. TECH. UNIVERSITY OF. ILORIN, NIGERIA.